Have you ever been to a Scottish Farmers' market? I know I shouldn't but whenever I see a sign for a Farmers' market, I get quite excited at the thought of all the produce, the fruits, the veg, cheeses, breads, honey etc. I imagine taking beautiful, colourful photos there too. I imagine comparing 10 different types of tomatoes and haggling for the best price. So I go along only to find about 8 stalls - 1 selling overpriced, pre-packaged tomatoes - already with price lables so no negotiation possible, 1 selling small, homemade cakes, again at inflated prices, ditto the Indian carryout stall, the 1 meat stall and the 1 fish stall etc. Silverburn's Farmers' market on Sunday added a face painting (no thanks) stall and a homemade soap stall. We really don't get it. On the continent you can spend hours in a farmers' market. At the end of the day you can pick up a bargain or two as everything has to be sold. Produce isn't packaged and priced like in Marks and Spencers. The quantities are all wrong too - the sellers seem to expect few visitors and bring very little produce - of course this is also why they overprice it. I think they believe people should be willing to pay more than at the supermarket because they want people to support local farmers rather than expecting to sell to us slightly dearer than they do to supermarkets but slightly cheaper than we buy from the supermarkets. They expect to attract quirky people - hence the face painters and jugglers, rather than your average guy. 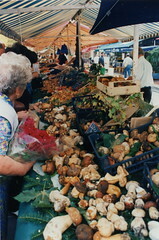 Please send the farmers' market organisers on a day-trip to Aix or Nice market and then provide us with a great continental farmers' market experience.